So now I am working on making a small version for Annas BabyBorn, Maja - later Anna will get the Surprise HelloKitty purse which I know she will totally adore. 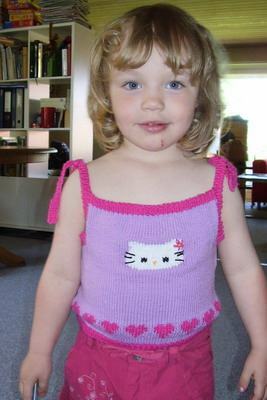 By the way: I chose to sew the Hello Kitty onto the top afterwards instead of knitting it directly because my intarsia skills are not up to my maybe perfectionistic standards - now Kitty is even, no jagged edges or anything - but maybe a bit heavier fabric, which I can live with looking at. Lovely picture of your daughter despite the injury.